In the years following the Civil War, "Arctic fever" gripped the American public, fueled by myths of a fertile, tropical sea at the top of the world. Several explorers attempted to find a route to the North Pole, but none succeeded. 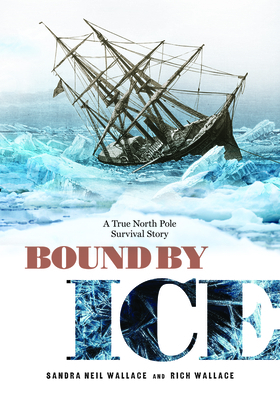 Bound by Ice follows the journey of George Washington De Long and the crew of the USS Jeannette, who departed San Francisco in the summer of 1879 hoping to find a route to the North Pole. However, in mid-September the ship became locked in ice north of Siberia and drifted for nearly two years before it was crushed by ice and sank. De Long and his men escaped the ship and began a treacherous journey in extreme polar conditions in an attempt to reach civilization. Many—including De Long—did not survive. A riveting true-life adventure, Bound by Ice includes excerpts from De Long’s extensive journals, which were recovered with his body; newspapers from the time; and photos and sketches by the men on the expedition. The title also includes an epilogue, author’s note, bibliography, source notes, and index. Sandra Neil Wallace had a lengthy career as a news anchor and ESPN sportscaster before writing realistic fiction and nonfiction for young readers. A pioneer in the journalism field, she was the first woman to cover the National Hockey League on network TV. Selected as a promising new voice in children’s literature by the Horn Book, Wallace’s titles have been named to state and national awards lists. She lives in Keene, New Hampshire. Visit sandraneilwallace.com. Rich Wallace has written more than three dozen novels for children and teens. His first novel, Wrestling Sturbridge, was selected by the American Library Association as one of the top 100 YA books of the twentieth century. His recent children’s nonfiction includes the acclaimed Blood Brother, co-written with his wife, Sandra Neil Wallace. He lives in Keene, New Hampshire. Visit richwallacebooks.com.